While the "based on true events" Wolf Creek might be the first film that comes to mind involving Australian director Greg McLean, it's his crocodile creature feature, Rogue, that speaks volumes about his style, which took the mechanics of something akin to Jaws and delivered a ferocious horror flick. With The Darkness, McLean once again dives into familiar territory, this time adopting the template of another Spielberg-driven production while dabbling in the haunted-house genre, fusing together dimly-lit spookiness with brewing family dysfunction. Unlike McLean's crafty twist on the monster movie, however, this supernatural horror film creaks and splinters with every hint of familiarity, unabashedly displaying its cribbed plot with every jolt and every response around the corner, not helped by the shallow family discord scattered within. The Darkness opens with a standard two-family vacation at the Grand Canyon, where parents Peter and Bronny Taylor (Kevin Bacon and Radha Mitchell) catch some alone time while the kids -- teenager Stephanie (Lucy Fry) and young autistic boy Michael (David Mazouz) -- explore the landscape. Michael, who sees and reacts differently to things, mistakenly escapes from his sister's observation, landing him face-to-face with an ancient tribal religious site. Eventually, they all meet up again for the trip back, though the family's unaware of what they're bringing with them. After being home for awhile, strange things start to happen around the house, from appliances turning on and doors opening to strange odors permeating the house. While juggling the petulance of their high-school daughter, busy architect Peter and recovering alcoholic Bronny find themselves at wit's end while dealing with Michael, whose antics have turned darker, distant, and violent since the vacation. There's something commendable about how The Darkness attempts to balance its emerging supernatural threats with the tensions between the family members, hoping to add a legitimate dramatic angle to the atmosphere with their individual issues. From coping with an autistic child to controlling past demons involving alcoholism and promiscuity, McLean and his writers try really hard to give something of substance to the standard horror mechanics with this involving look at a disintegrating family dynamic. 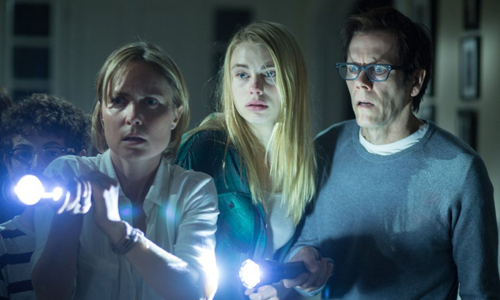 Both Kevin Bacon's escalating strain as a workaholic dad -- he drawn in shades of his performance from Stir of Echoes -- and Radha Mitchell's wide-eyed frustrations as the burdened mother work tirelessly to make the personal issues seem fraught and genuine, too. The cast can only accomplish so much when working with this kind of good-intended but ultimately rote scripting, though, which never gets beyond functioning like an obligatory, overly dour setup for the things about the go bump in their house. In fact, the interwoven family conflicts in The Darkness have the opposite of their intended effect: the lackluster drama actually waters down McLean's horror intentions, elongating the predictable and wishy-washy PG-13 paranormal spookiness. A lack of originality becomes the film's overbearing villain, doing little to spruce up the tired but generally reliable concept of innocent people bringing something back -- a relic, a curse, some kind of monster -- from an ancient or foreign site, allowing monotony to set in with each recognizable howl, bump, and screech along the way. As the story travels from the orange-hued scenery of the Grand Canyon to the pristine domestic airiness of the Taylor's household, it's hard to escape the foreseeable evolution of how this eerie presence manifests in its new home, where mildly intriguing aspects involving black hand-prints and hallucinations of desert beasts are muted underneath clunky jump scares and even clunkier paternal anguish. While The Darkness does constantly seem like it's an overturned chair or demented clown away from being a remake of Poltergeist (and we've already had one of those), its ancient tribal essence and Michael's significance as an autistic child hold onto some novelty, just to see the emergence of its evil forces. McLean's culmination isn't worth the patience, though: despite swirling indoor thunderstorms and odd little copper wands working as PKE meters, there's far too much of the Spielbergian concept duplicated in the Taylor household, and not enough actual fright to justify it. McLean was able to get away with inevitable comparisons drawn between Rogue and Jaws because of the resulting thrills swimming around in his Australian creature feature, along with the raw amusement in seeing a croc unleashing its fury. The subtler eeriness of The Darkness doesn't have that, instead relying on an ominous mystery that'll lull one into a disinterested stupor while awaiting to see whether another house will get cleaned.